The DCM was instituted in 1854 to recognise "distinguished, gallant and good conduct" by troops in the Crimea. 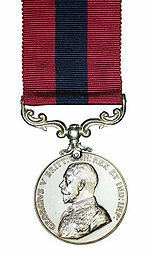 All DCMs were issued named to the recipient, usually with impressed details around the medal's rim. Nearly 25,000 DCMs were issued during World War I, compared to 1,900 for acts during World War II. The majority of World War I DCMs have citations in the London Gazette. Since 1939, DCMs are listed in the London Gazette but don't have citations. Full details of DCMs awarded up to 1914 can be found in the book "The Distinguished Conduct Medal" by P.E. Abbott, published by J.B. Hayward & Son. DCMs awarded during World War I can be found in a similar publication by R.W. Walker, but no citations are provided. Contrary to what may be implied by the term "Distinguished Conduct ..." it should be remembered that this medal was, for NCOs and other ranks, second only to the Victoria Cross. S/12836 Pte. H. Benson, 2nd Bn., Rif. Bde. For conspicuous gallantry. During a heavy bombardment by the enemy with trench mortars Privates Benson and Webster succeeded in digging out three buried men in broad daylight under heavy fire of all kinds.